Louisiana irises have a large variety of sizes and flower forms. Unlike some of the species of irises, Louisiana irises are not divided into groups by size of the plant, such as Tall Bearded, Medium Bearded, Border Bearded, etc. Louisiana irises can range from 10 inches (or smaller) to 50 inches (have seen plenty taller than that!). The diversity of color in the bloom of Louisiana irises is another subject. The name “Iris” is derived from a Greek word meaning “rainbow” and Louisiana irises certainly come in a “rainbow” of colors. I will try to do some follow up articles about the amazing colors of Louisiana irises. 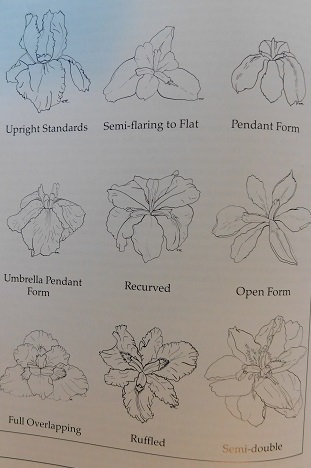 Publications will generally list the following flower forms for Louisiana irises but I think the list is not all inclusive. Upright Standards, Semi-flaring to Flat, Pendant Form, Umbrella Pendant Form, Recurved, Open Form, Full Overlapping, Ruffled, Semi-double. There is also a double form and a “cartwheel” form. I have been told there is a difference between a “cartwheel” and a “double” but the science is beyond my comprehension. Of course some blooms are a combination of these forms. You can easily find an iris with the open form that also has upright standards. The purpose of this “blog” is to discuss the open form of Louisiana irises and I have therefore not bothered trying to give the names of all the irises used in this discussion. Still open form but very close to being "semi-flaring"
The species of Louisiana irises, still to be found in the wild, almost always have the "spidery" open form. As they were hybridized, over the years, the various other flower forms developed. I believe this is probably the white form of iris.giganticaerulea. This is a classic example of the up-right standards form with the falls falling down and the stands standing up. But, it is also the open form because of the size of the petals and distance between them. This is 'Dixie Deb' by Frank Chowning registered in 1950 so it is not surprising that it has the open form. This iris is very well known and still wins awards at shows. Probably another example of the white iris.giganticaerulea. Many collectors during the early 1930-1950 era collected the species from their native habitat and actually registered and named them. While it certainly resembles the one above, it is a difference iris. This one is also the upright standards form while still being the open form. The falls are larger than the one above. This flower is just between the open form and the semi-flaring form. The falls and standards all lie flat out while the style arms often stand up. Another beautiful example of an older Louisiana iris, possibly species, with the upright standards and the falling falls, yet still the open form. I would suspect this iris was hybridized in the 40's or 50's, based on the size of the petals and the signal. I could be wrong! It is almost into the semi-flaring and almost flat with the style arms standing up. A very pretty blue iris with nice signals. I would certainly classify this as the upright standards form but because the petals are small, it still has the open form. While this flower has the open form, it is almost in the pendant form, where the falls and standards all fall down. Isn't that a game we played as children? This flower certainly has a pleasing color. It was not unusual to find colors like this growing in the wild of south Louisiana. I do not know if this is species or a registered iris, I simply do not know it and can't remember where I took the picture. A pretty white iris with really green style arms. Is it the open form or the upright standards form. Yes, it is. A very pretty yellow. Much larger than the 'Dixie Deb' shown above. Upright standards and almost drooping falls. I have no idea what the bug might be. Maybe a Texas mosquito? Blue, or Violet? Great signals. Still the open form. Note the bud next to it. The next two pictures are not Louisiana irises. To learn more about various iris species, visit this website. OK, iris experts. No, this is not a Louisiana iris. It is a hybridized iris.pseudacorus. I'm pretty sure this is 'Roy Davidson' or something like that. Notice that it has the open form, or is it the pendant form? A nice example of iris.virginica blue. It certainly has the open form, but is not a Louisiana iris, so who knows what the Species Iris Group of North America (SIGNA) people call this form. To learn more about Louisiana irises, visit their web site at Louisiana Irises. To learn more about different species of irises and the crossing of difference species of irises, visit this website - SIGNA. To Learn more about irises, visit the American Iris Society. Next time we will look at the many colors of Louisiana irises.